Support to Tondo Daycare Feeding Program – Jaime V. Ongpin Foundation, Inc. 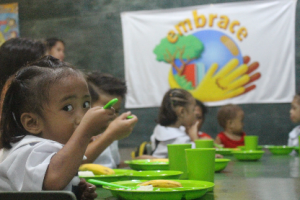 Through the Jaime V. Ongpin Foundation Inc., EMBRACE launched its feeding program in Childreamers Daycare Center in Tondo, Manila last October 17, 2018. This is in support of the daycare’s continuing program to help children ages 3-5 reach and maintain a normal nutritional status. Children from the daycare center enjoyed nutritious meals and were given multivitamins as well. The launch also included an orientation for the children’s mothers for the nutrition classes to be held once a month. Lissette Romero, the daycare’s administrator expressed her gratitude. “Thank you, this is such a big help. We’d love to continue with our partnership”, she said. Childreamers Daycare’s feeding program started in the year 2015 when a group of expat women who formed ties with the community, raised funds for its implementation.